Alex Ovechkin delivered a middle finger to the haters on Thursday night in Las Vegas. That middle finger stood 35.25 inches tall, weighed 34.5 pounds and was held high above his head as he skated around T-Mobile. He even gave it a smooch for good measure. Yes, the 32-year-old Ovechkin finally earned the Stanley Cup that so many people said he'd never get, at least not as the captain and central leader of the Washington Capitals. But Ovechkin and the Caps sealed the deal with a 4-3 win over the Vegas Golden Knights on Thursday, taking the Cup Final in five games. To top it all off, Ovechkin was awarded with the Conn Smythe Trophy as to the most valuable player to his team in the playoffs. It was a long-awaited celebration by both Ovechkin and Washington, as this Stanley Cup is a first for both. Ovechkin waited 13 years. The city waited 44. They've shared plenty of heartbreak and disappointment together on the long road to Thursday's triumph. The Caps took home the Presidents Trophy as regular season champions in each of the previous two years only to be eliminated in the second round at the hands of the Pittsburgh Penguins, their division rivals, who went on to win the Cup in both seasons. In fact, the Capitals had never made it out of the second round in the Ovechkin era despite nine previous playoff berths. Regardless of how much talent and promise Washington had attached to its roster, the Caps always came up short. It got bad enough to the point that the Caps were not only branded as postseason chokers, but their own fan base willingly embraced the mocking slogan "Caps' Year" as a form of self-deprecation and humorous coping mechanism every spring. Those narratives certainly weren't helped by the fact that Ovechkin's biggest personal rival -- Penguins' captain Sidney Crosby, who was drafted first overall a year after Ovi was the top pick -- had raised the Stanley Cup three times already. But the Russian winger took an eraser -- nay, a blowtorch -- to those narratives with his performance this spring. Doesn't show up in big games? OK, he only scored a playoffs-leading 15 goals and was second on the Caps with 27 points. He's only a one-way player? 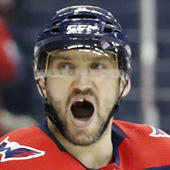 Ovechkin was an animal without the puck and a constant threat on the forecheck. He finished as a plus-8, blocked 14 shots and had the third-most hits of the playoffs (81). He doesn't care enough? The guy wore his emotions on his sleeve all postseason long and was one of the most emotional, animated players of the playoffs. Plain and simple: Ovechkin played some of the best postseason hockey of his career -- maybe some of the best hockey, period -- and it was a major reason why he'll finally get his long-awaited chance to party with the Cup this summer. So, with his name now destined to be engrained on that silver chalice, what does it mean for his legacy? Obviously, it helps. It's also a bit historic, as he becomes the first Russian captain to hoist the Cup. But, personally, I've never subscribed to the belief that it was necessary to validate his greatness. With or without a championship on his resume, Ovechkin is still one of the best pure goal scorers of this generation, maybe ever. He's got over 600 tallies to his name already and he just narrowly missed his fourth 50-goal season in the past five years, his eighth in total. He's 32 and isn't showing many signs of slowing down. He's only missed more than four games in a season once in his career. He has been one of the most electric and show-stopping offensive players in the league since the first time he stepped on the ice back in 2005. Aside from Crosby (and arguably now Connor McDavid), there may not be a player that has single-handedly been worth the price of admission like Ovechkin has over the past decade and a half. And the narrative that he was a poor playoff performer prior to this run was always a lazy and false one. He entered this postseason with 46 goals and 90 points in 97 career playoff games, which put him in the top-10 among active players in points-per-game in the playoffs. Most of the Capitals' shortcomings came not as a result of his postseason performance, but despite it. Any attempts to discredit Ovechkin's ability and achievements at the NHL level simply because he wasn't able to secure a Cup can be classified lazy and dumb as hell. Any team he's played on would've been much worse off without him. It's also funny that a lot of the same people that hold hockey up to be "the ultimate team sport" are often the same ones who will criticize a guy for not winning a championship, as if it's something that he can achieve on his own. Even the best of forwards, like Ovechkin, only see the ice for around one-third of every game. As such, this Cup doesn't exclusively belong to Alex Ovechkin; it belongs to every member of the 2017-2018 Washington Capitals, because it took pretty much every one of them to get those 16 wins required to hold it. This year, Ovechkin's teammates picked him up as much as he picked them up, and that's why that "chokers" label now sits discarded in the trash. But if Ovi wants to stick this Cup in the face of his haters, laugh and tell them to shove it over all the crap that's been written and said about him over the years… well, I think he's earned that right. And that's what it has done for his legacy.